Some days you just need a bottle of wine and change back from your ten dollar bill. You know that means the goal is simple pleasure -- no hopes for gustatory greatness. 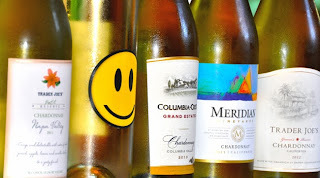 To help you with such a search, I convened a small group of amateur drinkers and eaters (OK, and one very talented chef, too) and we sampled what I've billed "five for six at TJ's" -- that's five chardonnays, purchased at $5.99 each at Trader Joe's. You could do this, too, if you were very thirsty or had enough like-minded friends.